The retail package of the Galaxy Y is typical for the price range. Next to the USB cable and charger, you'll get a 2 GB MicroSD card with an SD adapter. What's missing is the headphones and it's not the first time Samsung have done this. They needed to cut costs obviously and maybe the idea was to let users buy their headset of choice. It seems to us though that the headphones are an essential accessory. Maybe Galaxy Y buyers could've done without a data cable or a memory card. 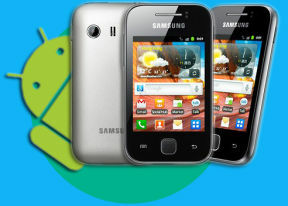 The Samsung Galaxy Y is a small handset measuring 104 x 58 x 11.5 mm. At a mere 97.5 g, it's among the lightest droids too. The all-plastic body handles nicely and doesn't raise doubts over durability. The styling of the Samsung Galaxy Y is somewhat bland, perhaps a bit too conservative . The handset is entirely made of plastic, but to be fair, it feels good quality. The textured back is nice to the touch and good at hiding fingerprints, while the front is taken up entirely by the screen and black bezel around it. The phone's tapered edges give a more comfortable hand feel. Size is comparable to the HTC Wildfire S, which is among the main competitors. There's definitely no trouble carrying the Galaxy Y around. The 3" capacitive touchscreen has QVGA (240 x 320) resolution and multi-touch support. The screen is pleasingly responsive but the image quality however is below par. It's not just the low resolution - the display has poor viewing angles, low brightness and contrast. Above the display you'll find a proximity sensor. An ambient light sensor is missing so you’ll have to manually set the brightness to match changing lighting conditions. Even at maximum brightness, sunlight legibility isn't up to scratch. There's no front-mounted camera either. The backlighting of the capacitive Menu and Back keys comes on only upon a press. When not used, they're invisible, creating the illusion that there's a single button on the phone. There's no haptic feedback for either the screen or the capacitive keys. On the right of the phone there's only the power/lock button. It’s thin but sufficiently raised with good press. The left side of the phone features the volume rocker and a lanyard eyelet. The top of the Galaxy Y is where the connectivity ports are: a MicroUSB port, hidden under a plastic lid and a 3.5 mm headphone jack. The microphone pinhole is located at the bottom of the phone, which is where you'll also find the thin slit to put a fingernail in and pull the battery cover open. The battery cover of the Galaxy Y has a textured non-slip finish. It doesn’t quite affect the actual grip but makes the device a little more appealing. The matt finish is fingerprint-proof but the thin grooves might gather dust over time. The 1200 mAh Li-Ion battery is quoted at 850h/540h stand-by (2G/3G respectively) and 17h/6h of talk time. Our unit did quite well actually - one benefit of the small, low-res screen is that it isn't a battery hog. Even at the busiest of testing, the Galaxy Y easily stuck out 2 days on continuous 3G and Wi-Fi connection. The SIM card finds its place under the battery, where it's held by a standard metal hinge. The microSD card can be hot-swapped but you need to remove the back panel to access the slot..
Neat and simple, with a bit of style sense, the Samsung Galaxy Y is affordable without looking cheap. It's plastic without feeling feeble. The back panel is nice to the touch, although it could be the wrong color to some. The phone has a good hand fit and is generally very friendly and welcoming. The low screen resolution is the major letdown. No, we're not saying that because we've seen and tested some HD screens lately. The thing is users upgrading from a feature phone will see no upgrade whatsoever in a QVGA screen. But then, even if it doesn’t look its best in QVGA, Android is the bigger part of the deal. That's next on our list, right after the break.